At my ripe-but-not-old age, I have finally, yet reluctantly, concluded that mothers know best. This message was brought home to me Saturday night by the mother of the famous clarinetist Derek Bermel. She whispered (entre nous) to me “I told him not to play the trumpet.” Thus, she took credit for his world renown as a clarinetist. My mother knew best too. She told me not to play the clarinet. Appealing to my vanity, she said “It will make your lower lip larger than your upper lip.” That did it. I gave it up. In retrospect, she saved me from either a large lip or stage fright. Either, way she was right, as was Derek’s mom. My decision to give up playing the clarinet was totally validated at a Music from Copland House concert at Merestead Mansion. 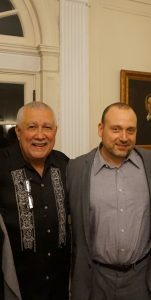 The composers and clarinetists Paquito d’Rivera and Derek Bermel rocked the more-than-100-years-old, 26-room house. The music was so audacious that surely William Sloane, the original owner of the place, would have surely bequeathed Merestead to Artistic and Executive Director Michael Boriskin and his band of merry musicians. You see, Michael has this vision of turning the mansion into a residency place for composers and musicians. While waiting for the powers that be to grant him a lease, he is delighting audiences in the main parlor with world class music. But I digress. My mother, having saved mega bucks on my clarinet lessons, put her money where my mouth was at an orthodontist. He rescued my bite, my lower lip and my mother’s sovereignty. Photo courtesy of Copland House, Inc.